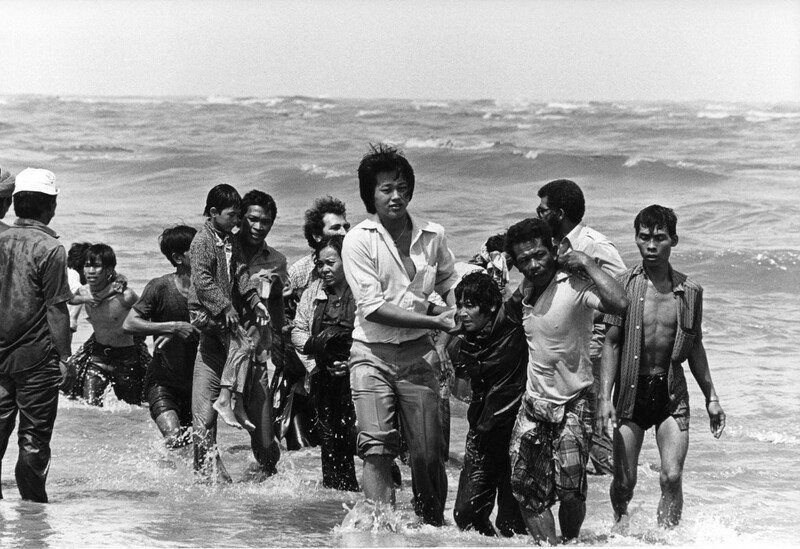 A picture taken in the late 1970s shows a group refugees (162 persons) arrived on a small boat which sank a few meters from the shore in Malaysia. We are writing this letter because one of you will be the new Prime Minister in the very near future and both of you are Christians. In your case, Mr Rudd, you achieved prominence after your essay Faith in Politics appeared in the October 2006 edition of The Monthly, a year before you won the election and your first appointment as Prime Minister. In that essay, you nominated as your personal hero Pastor Dietrich Bonhoeffer, the Lutheran pastor and theologian famously executed by the Nazis in 1945 for involvement in the plot to assassinate Adolf Hitler. In your case, Mr Abbott, you have been less willing to make your own religious faith a matter for the areopagus of public opinion and debate – a position we understand and respect – but, nevertheless, the media have not ceased to remind Australians at almost every opportunity that you are, in fact, a Catholic. Whether by design or not, both of you are the most identifiable Christians in Australian political life today. The reason for this letter to both of you is the announcement by Prime Minister Rudd last Friday of the latest change to Australian policy on asylum seekers arriving in Australian waters by boat. In your case, Mr Abbott, you have gained political traction over years out of the refrain that a Government led by you would ‘stop the boats’. Therefore, your initial generally favourable response to the announcement, welcoming PNG Prime Minister Peter O’Neill’s “generosity” towards Australia in this matter was, if nothing else, consistent. In your case, Mr Rudd, we must admit to some confusion. From the comments made by yourself and your Minister for Immigration, Tony Bourke, we understand that an important reason for this sudden change in policy was the urgency of preventing children from drowning on the high seas. We must admit that we wonder when, exactly, this realisation became important enough to you to change (yet again) a policy which successive Labor governments have been changing since the election of 2007, especially given that it has been known for decades that numerous people have drowned at sea attempting to reach this country. To be honest, Mr Rudd, we find it hard to believe you. As a result, we would prefer that you do not pretend that this sudden change in policy was the result of a sudden moral illumination on your own part, when it appears reasonably clear to most people in Australia that the reason for this decision is primarily your own desire to be Prime Minister. Dear Mr Rudd and Mr Abbott, we remind you of another flood of boat people in the recent history of this region far greater than the present ‘crisis,’ which resulted in hundreds of thousands and possibly millions fleeing for their lives from Vietnam to countries in this region, including Australia. We remind you that while there was an undercurrent of hostility in parts of Australian culture to Vietnamese refugees and asylum seekers, in the end Australia accepted and benefited from their presence – and became the richer for it. Meanwhile, as both of you know perfectly well, PNG is a still-developing society with a much smaller population than Australia, with almost nothing in the way of infrastructure that would be needed to deal with this challenge – from health care to social welfare or education, for example – and with deep-seated social problems such as the violence of the Raskol gangs who often rule the streets of PNG’s largest cities, Port Moresby, Lae, Mt Hagen and many other inland areas, particularly the Highlands. Money does not solve all problems. There is, of course, another dimension to this issue. That is the importance of honouring this country’s obligations to the right that those fleeing persecution and violence in their homelands, such as Iran or the fratricidal conflict presently occurring in Syria – to name just two examples – have to sanctuary in the countries in which they arrive. We do not pretend the problem is easy, but we remind you all challenges are solvable, particularly if they are approached from the intrinsic dignity and worth of every human person. This principle was enshrined in the UN Convention relating to the Status of Refugees to which the country that both of you aspire to lead is a signatory. Finally, Mr Rudd, we remind you of another precedent we find particularly interesting given your nomination of Pastor Dietrich Bonhoeffer as the man you admire most in the twentieth century. In 1939, the MS St Louis, an ocean liner heroically captained by Gustav Schroder, arrived in Cuba carrying 937 German Jewish refugees. The St Louis was first refused entry in Cuba, then the US, then Canada, before eventually returning to Antwerp, despite the fact that the governments of all of these nations were well informed as to what kind of persecutions the St Louis’ passengers were fleeing. Today, no-one knows with certainty but historians and authors generally conclude that at least a quarter of the St Louis’ human cargo – men, women and children – perished at Auschwitz and Sobibor. Mr Abbott, we urge you to recall history, both that of the St Louis and of Indo-China after April 30, 1975. We know that you know what that date is. Mr Rudd, we feel constrained to point out to you that a policy such as the one you have enacted purely in the interests of your own re-election appears to have some disturbing resonances with the experience of the St Louis and her honourable captain. And we are not confident that Pastor Bonhoeffer, another honourable man of principle – to the very end – would approve of your latest u-turn at all.